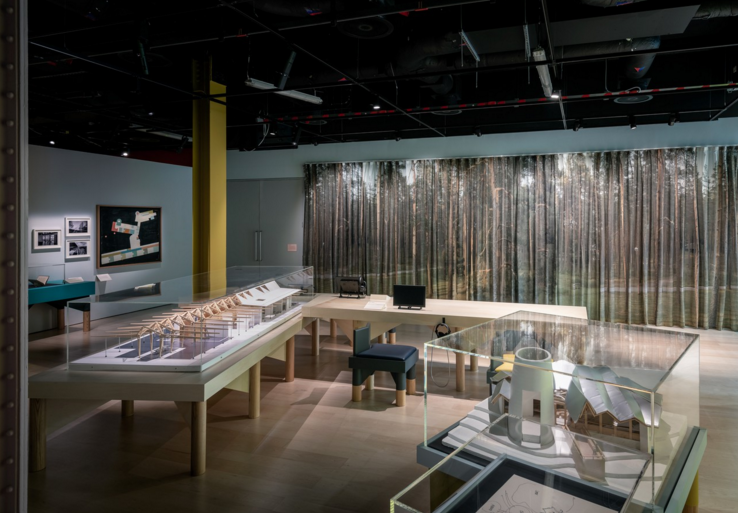 Living with Buildings, the exhibition currently on show at the Wellcome Collection gallery, explores the connections between architecture and design and our personal and communal health, looking two centuries back to explore the progression of living conditions and life across the UK. The exhibition follows the gallery’s identity in approaching narratives of health and the wider cultural implications of the human experience. Paris, Montparnasse by Andreas Gursky. Marianna Mukhametzyanova: Where did the idea for the exhibition come from? Emily Sargent: Architecture seemed like a really wonderful opportunity to bring together lots of those different aspects that we as a gallery are interested in: stories, objects, narratives of health. We all have a relationship with architecture, whether it’s the buildings we walk past, the buildings we live in, or the buildings that we seek healthcare in. We found there is a sense of real urgency and timeliness to be thinking about this project. While our exhibitions normally take a few years to develop, the first conversations about Living with Buildings coincided with the Grenfell-connected London riots. We joined a larger discussion on housing, cities, and people that was crystallising at that time. Paimio chair, 1930-2 by Alvar Aalto. Royal London by Catherine Yass. MM: I know that you think there’s a complex relationship between health and buildings. Why do you think that is, why is it so hard to get that relationship just right? ES: In the Living with Buildings exhibition we start exploring this relationship in the 19th century. There’s a tangible link there, a reasonably straightforward solution. Some of the circumstances in housing often led to poor health: overcrowded rooms with inadequate draining, no air circulating at all. You can see how all these were circumstances for disease. Later architectural responses to these conditions start to alleviate some of them, but not exclusively. There’s this wonderful, little book which I love, called Dangers to Health, written in the 19th century by a doctor who was presented with so many cases of ill health that originated from living conditions. He started to diagnose the house along with the patients. The link was so direct, and the solutions could be mapped onto that: sort out the drainage, open the windows, or create an opportunity for ventilation. “Your Britain: Fight for it now” - Medical facilities available at a modern health centre contrasted with ill health in old-fashioned housing by Thomas SG Farnetti. In the 20th and 21st century, that relationship becomes more complex. Infectious disease and public health are no longer central concerns, although they remain relevant. Many Londoners still live in just terrible conditions, mould, and poor ventilation, but for the most part we have decent sanitation and are safe from cholera and other diseases of the past. While we tell the story of health and buildings, architecture and experience, we always have the uninvited guests of politics and economics. They are key players in how we think about housing today. MM: How do you see the difference between designing and building for health in the past and today? 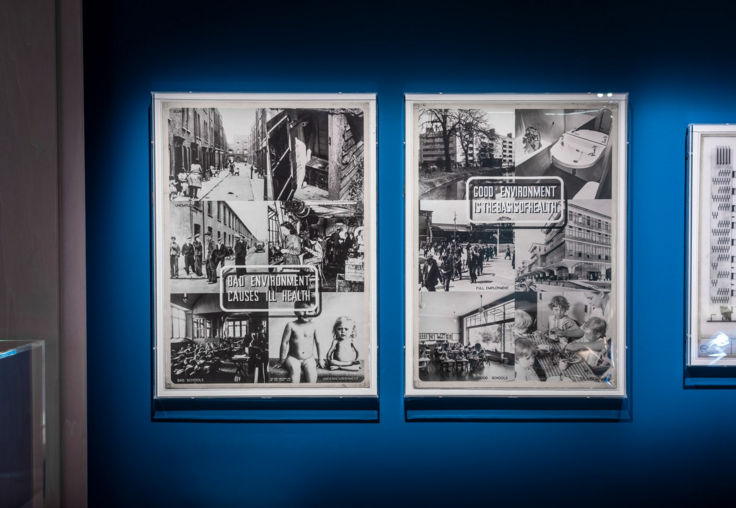 ES: One of the stories we tell in the exhibition is the post-war mood, this big visionary movement for rebuilding after the war, which has echoes in present time. The poster by Abram Games, which contrasts a clean, modern block of flats, with a white-washed exterior with a crumbling row of back-to-back housing, encapsulates the vision of what modern architecture can do, which is to bring modern and decent living conditions for the majority. Today, we can rethink some of the 20th-century developments. A bold vision based on welfare state principles cannot be replicated today. That era was defined by decency and a care-taking state; today, we navigate luxury and affordability as main principles. The uninvited guests of politics and economy show up again. The government has promised to create a model of housing for the 21st century, which raises interesting questions: What might that look like? Who can afford it? It remains to be seen. Bath Road, London, 1897 by Camillo Pissarro. Descriptive map of London poverty, 1889 by Charles Booth. MM: With traditional family structures changing and a lot more people living in transit now, do you think urban planning will have a focus on health at all in the future? ES: I think it is going to have to. We must acknowledge hidden conditions, although very different to the severe ones in the 19th century, that play a part in our day-to-day lives. Mental, societal, and community health, self-esteem and decency are the things that our environment really does have a role in. It’s a different of living, thinking, and ultimately building. Clinical treatment may no longer be central but it is replaced by the need to create the right environment for recovery. Contemporary needs such as self-esteem, decency, human rights need appropriate, clearly more complex responses. It’s not as simple as plumbing in a toilet, which was the kind of responses that we were looking at 100 to 200 years ago. MM: A piece in the exhibition, a video called Royal London by Catherine Yass, shows a demolition process. There was a camera at the bottom of the demolition, so you could see it all falling straight down. What was the idea behind including this piece; what does it narrate? ES: Catherine is very interested in the role of buildings and memory. The building that you see coming down is one of the buildings of the Royal London Hospital, originally built in Whitechapel. Generally, if you were financially affluent, you could choose to be treated at home, but these hospitals were for those who would otherwise not be able to afford medical care, which was of course accessed through the NHS. That building was used until recently, as well as many other additions, but in 2009 a new mega-hospital opened behind the Royal London. It’s a new hospital structure that’s grown up in the very tight footprint of this very urban setting for a hospital. King’s Fund model hospital. Source: Science Museum, London. Just before entering this room, the visitors can see a large model of a 1930s hospital, an archetype of a “modern” hospital used for fundraising and philanthropic events. Inside the model, you can see the x-ray rooms, the operating theatre and the wards: a true vision of modernity at the time. Immediately after, you encounter Catherine’s demolition video – the end of life for that building. The juxtaposition is revealing and though-provoking. MM: I also noticed how many references there were throughout the exhibition to fiction, especially to Dickens. What do you think the relationship is between fiction and buildings, especially in that era? ES: The machine of the industrial revolution that was fuelling the empire at that time provided both a very atmospheric tone and indignant frustration in many writers and artists. Squalor, discomfort, and oppression of the working poor became themes. Dickens walked around London making observations that inspired his fiction, seeing his role was to draw out the voices of those he was observing, otherwise voiceless or powerless. For Dickens, this meant defending a vision of progress against establishment figures who denied that those kinds of conditions existed and rejected projects of improvement. 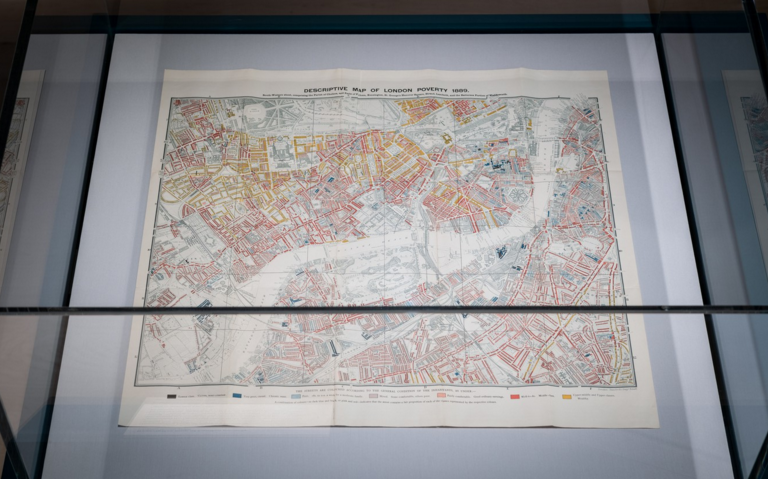 The works of artists and writers can have a cartographic role, they can be used to map the city at a point in history, together with statistics, reports, or studies. Their popularity, though, ensures a greater capacity to speak for those silenced and unable to defend themselves. Proposed designs for architecture and town planning of Milton Keynes: boulevard and railway station. Source: RIBA Collections. Good Environment is the basis of Health. Source: RIBA Collections. MM: Would you say that architects and designers approach design at times in a very utopian way, thinking about how things can be better whilst ignoring the more practical and realistic uses of space? ES: That’s an interesting question. I think the idea of architecture as being a road to which better living circumstances can be achieved is a valid one. Good design is very important in creating successful communities or providing environments in which some utopian ambition can flourish. If you’re designing a community, you want to think beyond the limitations of units. I think that’s what really struck me when looking back on these developments and different architectural styles, from Milton Keynes to Balfron Tower: there was a vision of something wider than units. The thing about utopia is that it doesn’t exist without an intersection of reality, whether or not that’s a compromise of that vision entirely. That’s what happened with Lancaster West: problems originated from compromise made to the original vision. Tenants were left isolated, trapped by the train-line, with no access to shared communal facilities. The original vision had a shopping centre which would create a link across to the neighbouring housing estates, but that vision for a community was entirely scrapped. The important consideration is where utopia and reality meet. Landscape, Paimio by Giles Round, Thomas SG Farnetti. MM: Why would you say architecture became so closely connected to utopia? ES: If you’re thinking about a utopian existence, architecture has significant roles: it makes us feel good on an individual level, on a community level, and on a societal level. That’s the kind of utopian vision that holds together many architectural projects. I think that’s precisely the distilling element – it’s not just about the individual, it’s about creating communities. MM: What’s your favourite piece from the collection? ES: There are so many wonderful works and such a diverse range of material in the exhibition. It’s great to have the Booth Maps there. There’s also material that we’ve taken from other institutions. It’s a great privilege to have the Gursky photographs in the exhibition, a nice play with scale and individuality. I also find that the hospital model from the 1930s is intriguing, I keep returning to it.